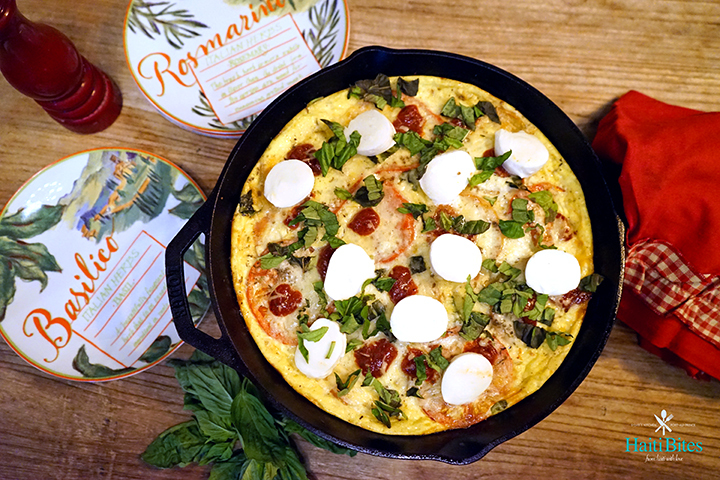 Want to try a delicious vegetable frittata? Perfect for breakfast, lunch and diner, it is a great meal when served with a side salad and a glass of crisp white wine if you may. This one pan meal, is easy to make and can be completely vegetarian if you leave the pancetta aside. Cooked and baked in my cast iron pan, it goes from stove top to oven in no time, heating evenly throughout. Cast iron pans get better with time, so the more often you put yours to use, the better. Easy to make, this recipe of layered eggs, eggplant, tomatoes and onions topped with fresh basil and bocconcini is a real treat. Bocconcini are small egg-sized mozzarella cheese balls, with a semi-soft and elastic texture and mild buttery flavor. Originating from Naples, Italy, just like other mozzarellas, they were once made only from water buffalo milk. Nowadays, they are made of cow milk for most brands. But if ever you lend your hands on the water buffalo milk ones, you’ll have tasted a bite of heaven. On the pricier side sure, these are the delicatessen version of mozzarella. Simply delicious. 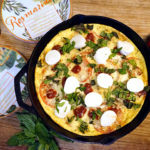 Added on top of the warm frittata, they soften lightly and bring a burst of flavor and texture to every bite. It’s true. Eggplant stole my heart. And any mix of fresh organic eggplant, basil and tomatoes topped with delicious cheese is a winner in my book. This light and fluffy frittata is certainly no exception. Try it at your next brunch, or any week night diner. You will not regret. Easy one pan recipe. Perfect for breakfast, lunch and diner. Bocconcini mozzarella topped eggplant frittata, simply delicious. Start by prepping your vegetables and slice thinly your eggplant. tomatoes and onions. Preheat your oven at 375 °F. Quickly sauté your pancetta until golden and crisp and set aside. Sauté your onion until slightly clear and set aside. Add remaining olive oil and sauté your eggplant slices until slightly golden and crisp on the edges and set aside. In the mean time, prep egg mix and sauce. To prep your egg mix, whisk together 8 eggs and add in your milk. Add salt and pepper to taste. To prep your sauce, mix together ketchup, garlic, Italian herbs and sugar. Add salt and pepper to taste. Off of oven top, in warm cast-iron, pour half of your egg mix and line with eggplant slices, ketchup dollops, onions, pancetta and tomatoes. Sprinkle with some Italian herbs, salt and pepper and top with 3/4 cup of shredded mozzarella. Add a few dollops of ketchup. Add the remaining shredded mozzarella to your egg mix, and pour on top. Place in center rack of hot oven for 30-40 minutes and let cook until firm and golden. (Don't let your frittata get too hard though. You want it to be nice and moist). Remove from oven and top with remaining ketchup sauce. Garnish with halved Bocconcini balls and fresh basil.